LaVonda Earley-Stacey always hated watching her son fight. She never thought she would pay men to try to beat him up. She warmed up to it eventually, however, and last year founded Vegas Grand Boxing Promotions. She quickly became one of the most active boxing promoters in Charlotte, though others in the local boxing scene think the quality of those fights doesn’t justify the quantity. Vegas Grand started as a way to create opportunities for her son, undefeated pro LaVonte “The World Class Gentleman” Earley, and has since made Earley-Stacey in a small group of people fighting to save boxing in the Queen City, even if they’re not working together to do so. 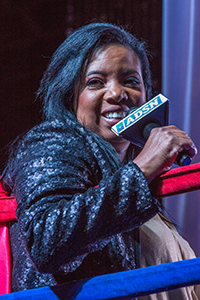 Earley-Stacey admitted that she had, “zero boxing experience” when she launched Vegas Grand, but she saw potential in the fledgling fight scene. “There’s room enough where we can establish something that’s great,” Earley-Stacey said. Dramatic lighting, drapes flowing from the ceiling and nightlife decor adorned the interior of Extravaganza Events Center on Jan. 26 during Vegas Grand’s boxing card. Looking more like a nightclub than the stereotypical smoke-filled bingo halls where boxing takes place, Extravaganza made for a beautiful setting to watch someone get knocked unconscious. It also had that added intimacy unique to untelevised, local boxing in which attendees can watch an athlete compete in a match then walk straight from the ringside doctor to the concession stand to buy a beer. Earley-Stacey said she wants her company to promote “upscale boxing shows in the Carolinas,” but unfortunately the spectacle has had trouble translating to the in-ring product. No bout lasted more than two rounds during Vegas Grand’s January show, and every bout ended with an overwhelming favorite stomping an overmatched competitor. “We are building talent,” Earley-Stacey said. In the main event, Willie “Lump Lump” Harvey knocked out Wilson-native Paris Liles in 11 seconds in the latter’s debut fight. Vegas Grand isn’t the only one putting on boxing events in town, and word spreads fast when shows like the January card put on seconds-long fights. “When I have somebody across town putting on crap shows, it hurts what I do as a professional promoter,” said Christy Salters-Martin, founder of Pink Boxing Promotions. Back when she was just known as Christy Martin, the coal miner’s daughter from West Virginia was a regular on the undercards of Mike Tyson fights and Don King-promoted pay-per-views. Her success led to a Sports Illustrated cover story, appearances on late-night talk shows and arguably the most notable female boxing career of the 20th century. 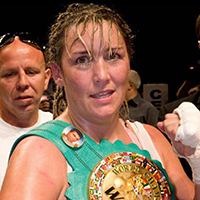 The Hall-of-Fame fighter who made a career as a trailblazer for women’s boxing has been the standard bearer for Charlotte boxing. So far, she’s had the best success attracting casual boxing fans, wannabe Instagram influencers and late-20s singles looking for something to do on a given night. It’s not uncommon to see boxing royalty like former world champion Zab Judah at a Pink Boxing Promotions event; or former Charlotte mayor-turned-federal-inmate-turned-radio host, Patrick Cannon. She drew a standing-room only crowd (and a visit from the fire department) on Feb. 23 at CenterStage@NoDa. She was hesitant to give out the actual attendance number. “I can’t tell you because if I told you, the fire marshal would be knocking on my door,” Salters-Martin explained. To keep fights competitive, Pink Boxing Promotions relies on imported boxers from out-of-state — occasionally from out of the country. The last notable boxer from the Queen City, 2000 Olympian Calvin Brock, famously started boxing once his father bought a stack of instructional videos and became his self-taught coach. Brock’s success as a pro hit its pinnacle in 2006 inside Madison Square Garden where he fought for the heavyweight championship of the world. But an injury to Brock’s right eye forced him out of the sport and so began an era of boxing irrelevance in Charlotte. Today, North Carolina remains home to some obscure boxing trivia. The first two-time heavyweight champion of the world, Floyd Patterson, was born in Cleveland County. The first black heavyweight champion of the world, Jack Johnson, died after a car crash near Franklin County. It’s not just in North Carolina, however. The scene here has mirrored the decline of boxing in popular culture. At the height of the Carolinas Golden Gloves’ popularity, 11,000 fans filled the old Charlotte Coliseum. This year, a small crowd gathered in Sugaw Creek Rec Center to cheer on the Golden Gloves competitors, with little sense of that big-fight feel. The scarce amateur boxing scene has put the state and Charlotte in a prolonged rebuilding phase. A few years ago it was common to have promoters cancel more shows than promote. In 2015, there were just four professional boxing events held in Charlotte. Thanks to Vegas Grand and Pink Boxing Promotions, those numbers are starting to come up. Last year, Earley-Stacey and Salters-Martin accounted for eight of the nine boxing events hosted in Charlotte. Vegas Grand has a fight card booked in Charlotte every other month this year. 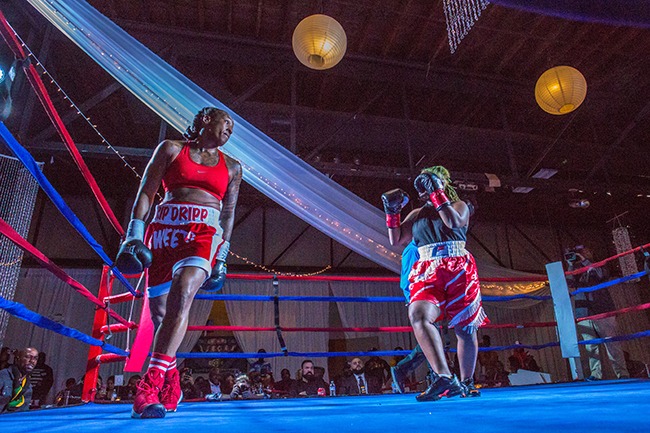 Pink Boxing Promotions has several events planned throughout the state, and returns to Charlotte in the summer. Both promoters have built a core stable of prospects, but there’s still a shallow talent pool to match them. 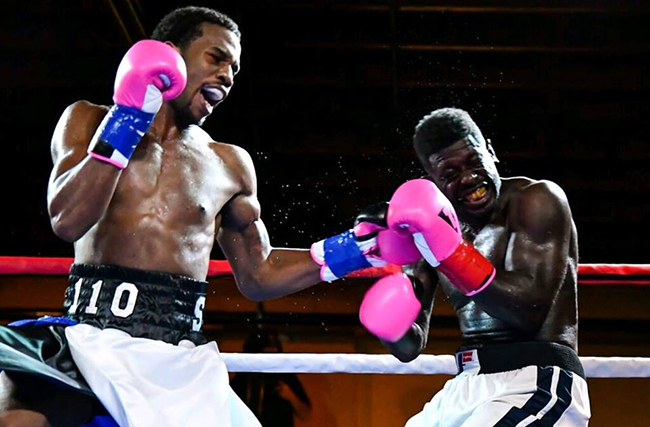 LaVonda’s son, LaVonte Earley (8-0, 5 KOs), fought at Extravaganza on March 16 under the Vegas Grand banner against a boxer with 3 wins, 33 losses and 4 draws. The combined record of the “A-side” fighters on that card was 44-5-1. Their opponents walked into the ring with a combined record of 15-68-8. None of the bouts featured two fighters with a winning record. “If you’re going to [fight for] Vegas Grand and you’re going to get knocked out in the first 30 seconds, you probably won’t be fighting [for us] again,” Earley-Stacey said. 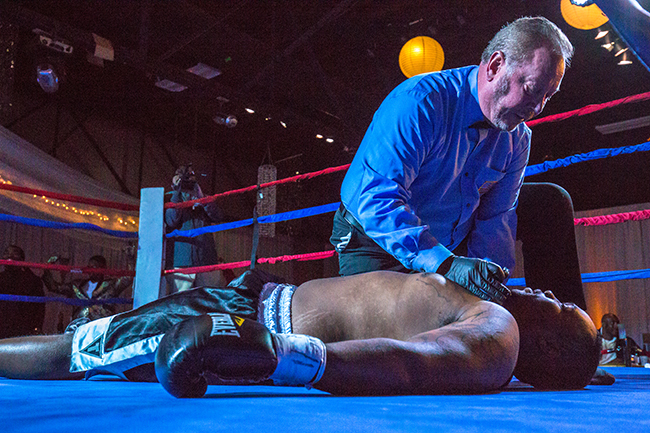 The matchups have tested the limits of what the North Carolina Boxing Commission will sanction. Earley-Stacey said she’s committed to improving matchups on her shows. “I learn something new every day,” she said. Earley-Stacey’s attachment to boxing through motherhood, and Salters-Martin’s attachment as a former fighter, clearly influences how they see the sport continuing to grow in the region. Earley-Stacey believes helping grow the scene is a matter of providing support.